Step out of your office and into a forested park! 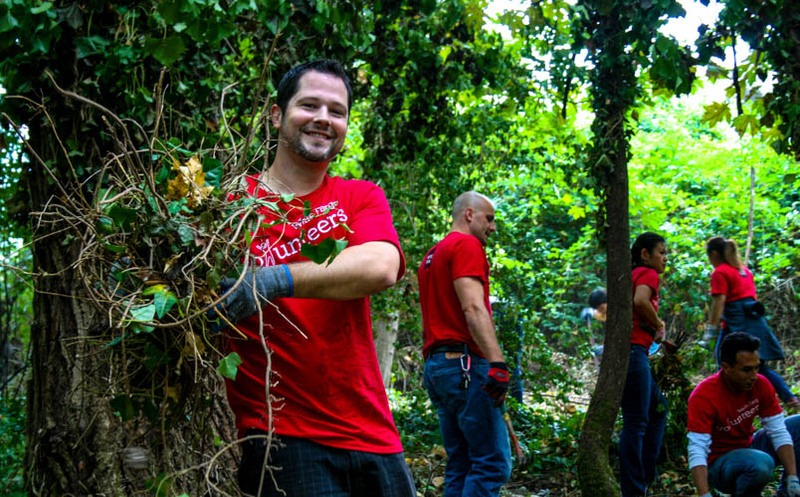 Your company can give back to the community by digging in and restoring Puget Sound area parks and urban forests. EarthCorps offers a range of mission-driven volunteer experiences that advance your corporate philanthropic and team building priorities. Typical activities include removing non-native plants that are threatening the forest health; planting native trees and shrubs to reestablish a healthy ecosystem; and caring for plants by applying fresh mulch. Are you sweating the details? Let us handle it. EarthCorps staff will take care of everything needed to provide your employees with a fun and fulfilling volunteering experience – from prepping the site to providing all tools, work gloves, snacks, and drinks. Our Volunteer Team will give an inspiring overview of the project and provide expert training and guidance throughout the event. Find the right volunteer event for your group. Visit our Volunteer Calendar to see if there are any open volunteer events that work for your group. Corporate groups of 3 – 100 are welcome to join any volunteer event that is open to the public. EarthCorps offers private volunteer events for corporate groups of 20 – 200. Private events are typically held on week days and last three or four hours between 9:00 am and 3:30 pm. Contact our Volunteer Team to discuss dates and locations. Private event prices are listed below. EarthCorps is an independent non-profit that depends on donations from supporters and sponsors. We greatly appreciate donations and sponsorships from our corporate partners. For more information about sponsoring an event or making a donation, please contact our Volunteer Team. What time are volunteer events? EarthCorps volunteer events are typically held from 10:00 am – 2:00pm. For private events, we can accommodate your scheduling needs. We find that events that are three to four hours long are the most fun and productive, allowing enough time to dive in to the project and create a visible impact. Events must begin after 9:00 am and end before 3:30 pm. Contact the Volunteer Team to schedule a private event. Where will the volunteer event be? EarthCorps works in dozens of parks and greenspaces in Seattle and Puget Sound cities. We will try our best to set up an event in a park convenient to your office. How many employees can participate in private events? EarthCorps can accommodate 20-200 volunteers at private events. If your group has fewer than 20 people, we recommend that you sign up for one of our public volunteer events. See our volunteer calendar for events open to the public. What should the volunteers wear? For your safety and comfort, please wear long pants and durable shoes that can handle a little mud – work boots, hiking boots, or running shoes are all fine. We also recommend a long sleeve shirt to protect your arms from prickly blackberry bushes. Make sure to check the weather and bring appropriate layers and raingear. It’s a good idea to bring a backpack to keep all your possessions with you. We cannot provide clothing or lunch storage at the park. We are happy to discuss costs and find a way to fit your budget! Send our Volunteer Team an email at volunteer@earthcorps.org to get started.